Notice! Elegance East Hotel - Luxury Concept does not accept reservations at this time. Please try again later. Elegance East Hotel - Luxury Concept Contact. Elegance East Hotel is a luxury hotel with 25 rooms. The hotel is in the centre of Kaleiçi (Old Town). Elegance East Hotel primary target is to fulfill the needs and expectations of our guests with best service. We offer you peaceful atmosphere in our hotel. Elegance East Hotel rooms are decorated with stylish furniture, you will feel very special and comfortable in our rooms. You can enjoy swimming in the pool or you may prefer to walk to the beach in 5 minutes. This hotel combines luxury and comfort in modern rooms; minibar, safe, air conditioning, television and satellite broadcasting. In addition, 24-hour reception, wireless internet and free parking. The outdoor swimming pool, equipped with sun beds and umbrellas, allows guests to enjoy the taste of the water and the sun. The public beach is reached on foot. The shopping centers are located at the walking distance of the tesise. Elegance East Hotel, Antalya Airport is located 14 km away from the airport. Elegance East Hotel will do our best to make your holiday unforgettable. Elegance East Hotel - Luxury Concept accepts VISA and reserves the right to temporarily hold an amount prior to arrival. Elegance East Hotel - Luxury Concept accepts Master Card and reserves the right to temporarily hold an amount prior to arrival. Elegance East Hotel - Luxury Concept accepts Maestro and reserves the right to temporarily hold an amount prior to arrival. Elegance East Hotel - Luxury Concept accepts American Express and reserves the right to temporarily hold an amount prior to arrival. The room size is 18 m² - 20 m². Luxury designed room will provide unforgettable ambiance during your holiday. The room size is 20- 24 m². The room is designed with palace style decorations to provide maximum comfort for our guests. The room size is 30m². You will feel yourself very special and comfortable in the rooms designed wih stylish furniture. The room size is 65m². The room consists of 2 bedrooms and 1 living room. It is suitable for big families. € 20 between the ages of 7-12 will be charged. Access to the facility rooms starts at 14.00. The departure time from the rooms is no later than 12.00. The use of outdoor open spaces is subject to seasonal conditions. Great and sweet staff. The placement of the hotel is perfect. Nice hotel with beautiful garden. The rooms are regular but so nice and lovely couple are manager of this hotel. Try their delicious breakfast. I am very glad to choose this hotel after hours of searching for the best hotel in antalya. 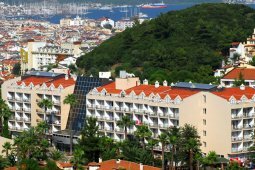 The hotel is located comfortably in the true heart of Antalya and is stretched into the old town for quick access to all the hotspots. The hotel has all the places of interest with in 30min walk from the Hadrians Gate (30second walk), Yatch Harbour (15mins) and all the charming old town streets. We stayed in a family twin room and it was nothing short of a open plan studio apartment. The beds were all queen sized and the decor was pristine and really stood up to the "Boutique Class" standard... Quite possible the best part of the hotel was the staff. They were all very smily and more than happy to help. Especially the receptionist "Shanazi" who went out of his was to translate the public announcement during the failed military coup. This kept us all calm and happy. All other staff were very receptive and warm. For a relaxing break, Elegance east really is a great hotel in the best possible location in Antalya. Also its highly regarded by the locals This hotel deserves a better rating online and I wouldnt hesitate to book here again in the very near future. Room decoration, fruits and wine are served.